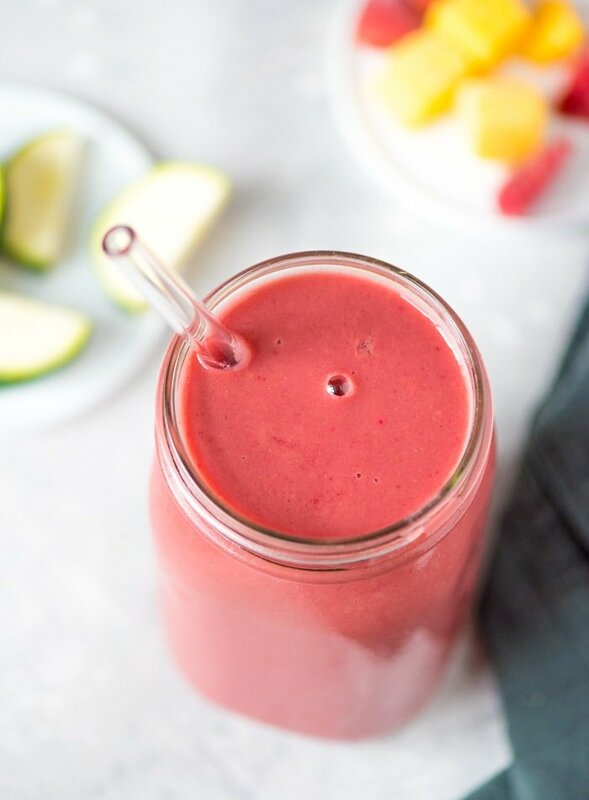 This strawberry mango smoothie includes two full cups of healthy, green veggies but is so deliciously sweet and creamy you’d never guess they’re in there. 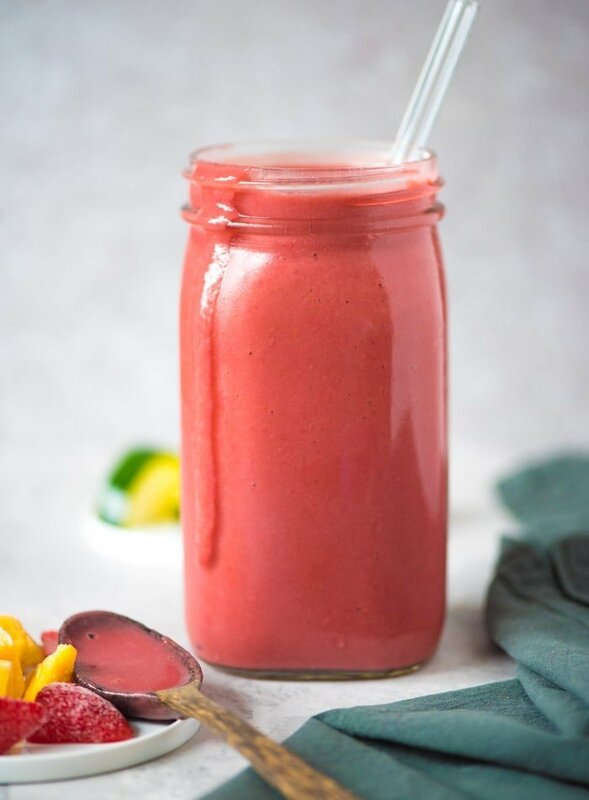 Almond milk and vegan vanilla protein powder add the perfect creaminess and sweetness and hydrating zucchini and celery add extra fiber, vitamins and minerals. I never make a smoothie without sneaking in some veggies. Whether its spinach, kale and cucumber it’s amazing how many you can cram into a smoothie without actually tasting them. Plus, I don’t know about you guys but I love a giant-sized smoothie that fills up a big mason jar. The best way to do this without adding more sugar and calories is to add volume with nutrient-dense, high-volume veggies. Adding veggies not only gets you a bigger smoothie but its also such as easy way to add essential fiber, vitamins and minerals to your diet. You can check out my Green Monster Smoothie for a how-to on creating green smoothies and for more veggie ideas check out the best vegetables to add to smoothies. For more veggie-packed smoothies, check out my Blueberry Sweet Potato Smoothie, Low-Sugar Blueberry Coconut Smoothie Bowl or my Vegan Mint Chocolate Chip Smoothie. If you’re not ready for veggie smoothies, my Peanut Butter Coffee Smoothie and Peanut Butter Cup Protein Shake are always a big hit! 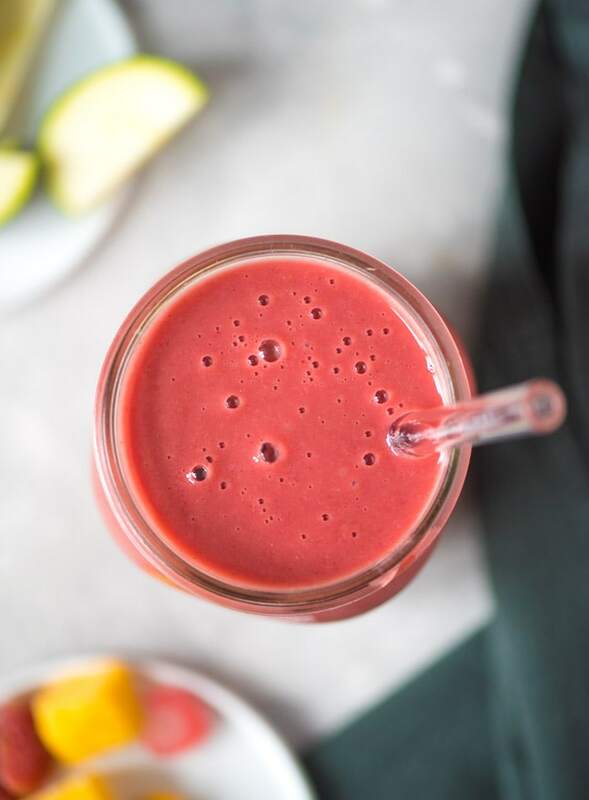 I really wanted this smoothie to have a beautiful pink colour, so I snuck in a little piece of beet to amp up the pink colour and add some extra nutrition. A few small chunks of raw beet and was enough to get the colour I wanted. This is totally optional but feel free to do the same. This recipe is also delicious as a smoothie bowl. To make it a bowl, add all the ingredients except for the almond milk, then slowly add it until you have just enough to get it to blend. Blend until smooth, then scoop into a bowl and top with ingredients like sliced banana, almond butter, hemp seeds and coconut. To make it a little sweeter and creamier, you can sneak in 1/2 a frozen banana. 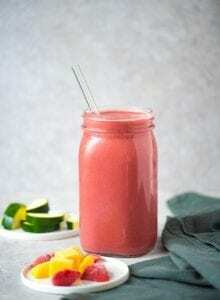 This recipe makes a large 1L smoothie or two small smoothies. For one serving, it’s 350 calories with 48 grams of carbohydrates, 6 grams of fat and 28 grams of plant-based protein. It also contains 11 grams of dietary fibre, half of your daily vitamin A, more than your daily vitamin C and if you use fortified almond milk, 85% of your daily calcium and 30% of your daily iron. 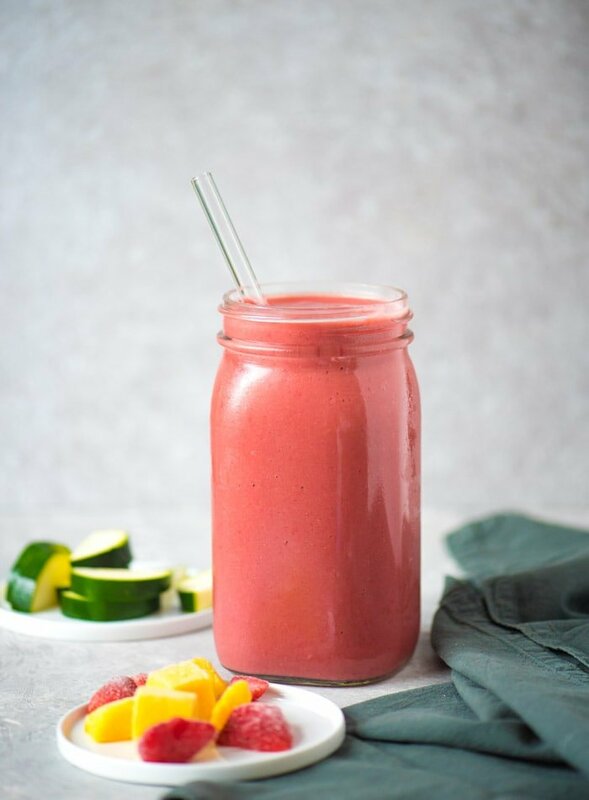 This creamy strawberry mango smoothie with almond milk has 2 full cups of sneaky veggies in it but you’d never guess it with its sweet strawberry mango flavor. Try it for breakfast, a healthy snack or high-protein post-workout shake. Add all ingredients to a high-speed blender and process until completely smooth and creamy. You can substitute celery or cauliflower for the cucumber or zucchini or use any mixture of celery, cauliflower, cucumber and zucchini up to 2 cups. For extra sweetness and creaminess, add 1/2 a small frozen banana. For extra pink colour add a few small pieces of raw beet or 1/2 tsp of beet powder. 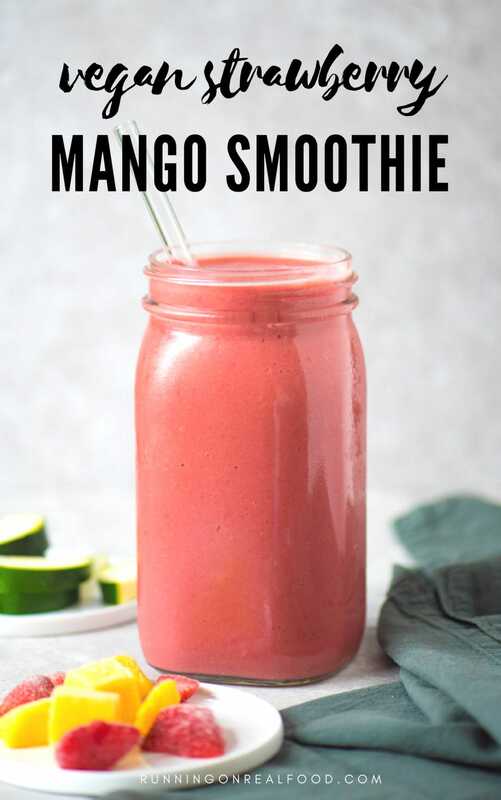 You can also make this smoothie with half 100% orange juice or another 100% fruit juice and half water. This is simply genius! I have recetly discovered that raw zucchini work just fine in smoothies and this recipe is proof. Also I am sold with anything that contains mango. I always get excited when I see a smoothie recipe without banana (I have an extreme dislike of bananas), so YAY for this recipe! 🙂 I started using zucchini in smoothies last summer, and it’s such a great addition! 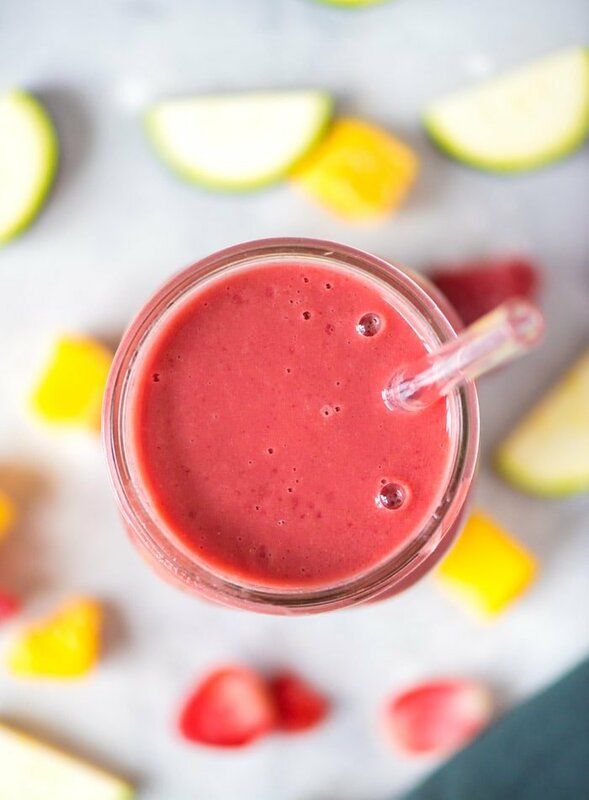 This smoothie looks so refreshing–can’t wait to try it!